A San Diego mayoral candidate Tuesday accused the campaign of incumbent Kevin Faulconer of attempting to obtain her personal work files and email messages. 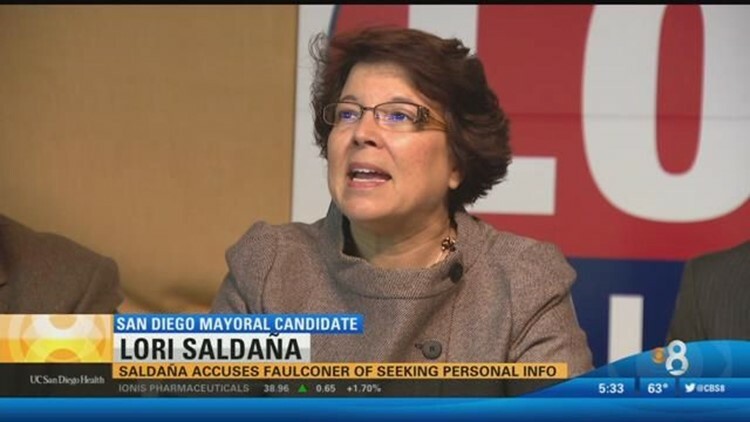 SAN DIEGO (CNS) - A San Diego mayoral candidate Tuesday accused the campaign of incumbent Kevin Faulconer of attempting to obtain her personal work files and email messages. Former state legislator Lori Saldana said she was informed by a San Diego community college official that a Washington, D.C.-based firm, Directive Research, had made the inquiries. Directive Research generally works on behalf of Republican candidates, said Saldana, a former Democrat who is running as an independent in the technically nonpartisan race. "I understand that Kevin is scared," Saldana said. "Over the previous 12 years, I've received more votes than he has from the people in San Diego, I have been reelected with large majorities in San Diego, and I have won in tough general elections with large turnouts." She also criticized the mayor for not signing a pledge to refrain from personal attacks leading up to the June 7 primary election. The code of fair campaign practices is routinely signed by candidates, she said. Faulconer's political consultant, Jason Roe, said that he was confused by Saldana's statements. "Mayor Faulconer has a very good and positive record and he plans to run a campaign focused on his efforts to move the city forward," Roe said. "As a rule, he doesn't sign pledges, but Ms. Saldana can rest assured that our campaign will be focused on the mayor's record, not hers." Faulconer is finishing the term of Bob Filner, who resigned in disgrace in August 2013. Ed Harris, the head of the city's lifeguards union and a former interim City Council member, is also in the race.